The Weibo Night Awards which held annually since 2003 was recently held in the China National Convention Center. Like always, the event was a star-studded affair for many pairs of eyes to see. One particular star netizens noticed was Huang Xiaoming, or more specifically, his left foot. He's an actor who often drew speculations over his height due to people thinking that he tries to appear taller than he is. 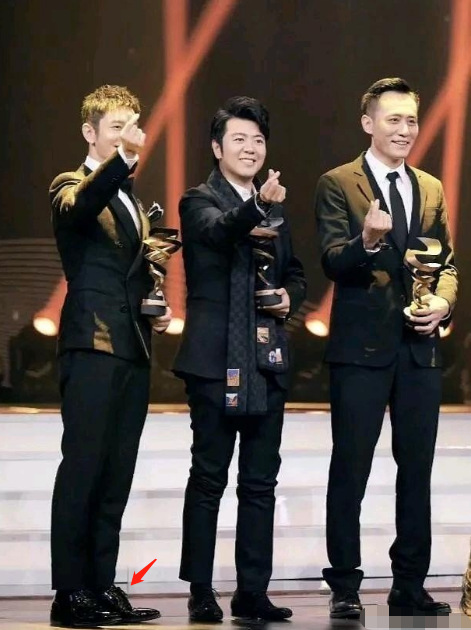 At 179cm, Huang Xiaoming looked tall standing next to Lang Lang at 179cm and Liu Ye at 186cm. However, netizens wondered why Huang Xiaoming's left shoe seemed to bulge up more than usual. Was Huang Xiaoming wearing shoe fillers for added height? Some jokingly commented that Huang Xiaoming's height was one of the unsolved mysteries of the entertainment industry. Huang Xiaoming recently addressed the speculations on social media and explained that he was born with a high instep. (The condition was aggravated after Huang Xiaoming got into an accident where he fell 3 meters & fractured two toes on his left foot while filming The White Haired Witch Of The Lunar Kingdom back in 2012.) Huang Xiaoming also revealed that it's painful to wear shoes and asked fans and friends with a similar condition to suggest places where he can buy shoes that are more comfortable to wear. Appearance is one the main selling points of the showbiz industry. So any irregularity, no matter how small, can be the subject of intense scrutiny. Huang Xiaoming, despite his injury, has chosen to move forward and not let things like a high instep stop him from being an extremely professional and hardworking actor. As such, a person of his caliber deserves our respect, not our shallow criticism. Huang Xiaoming is only 179cm what? Why does he often appear tall to me lol. I thought he'd be at least 180cm. The other actor I know with height of 179cm is Hou Minghao but it's not weird because he does look short. I originally thought he's around 177cm. Huang Xiao Ming has a slender body thus appearing to be taller than his actual height. Hou Minghao though, I won't believe he is 179cm until he stand side by side with Huang Xiaoming, lol. He looks short esp in When We Were Young that it seems theres only a few gaps (on height) between him and the leading lady.